Remember that Alvin & the Chipmunks movie where the boys and girls went around the world in a hot air balloon? I adored that movie and have dreamed about going up in a hot air balloon ever since I was a little girl. I even used to joke with my friends that a balloon ride was the only cliché method of proposing that I might actually accept. (smile) Alas, I didn’t get a marriage proposal last week, but I did finally get to go up in a hot air balloon! There are several local companies that fly mostly up in north Phoenix. I’ve had my eye out for a good Groupon for awhile now and diligence finally paid off last month! Sunrise hot air balloon ride with champagne breakfast for two – it made a good girls’ trip. (smile) Of course five seconds after I hit “purchase” the small part of me that doesn’t like heights panicked. But what’s a little anxiety compared to fulfilling a childhood dream?! Booking the actual date was completed online through the company’s website, and I had no issues completing the process even with the Groupon (major win there). We met up with the guides in Cave Creek (in northeast Phoenix) at 4:45am. Since the Groupon indicated “for two” I was surprised to see such a large group of people milling about. Turns out the balloon we were going up in held twenty (yes, 20) people!! It’s apparently the largest in the U.S., but none of this helped quell my nerves. Once everyone was there, we all piled into two vans and went to chase the wind. The team eventually found a launch site they were happy with and the inflation process began. It was really, really cool to watch them unpack this gigantic balloon from its trailer. It was even more amazing to watch it come to life right in front of us! After the balloon was up and ready, we were all distributed into our basket pockets. I bent to get something out of my bag and when I stood back up, we were off the ground – I hadn’t felt a thing! The company’s website indicates that balloon rides aren’t so bad for people with a fear of heights due to a lack of perspective (i.e., a tall building, etc. for comparison). I thought this was total baloney, but I have no problems admitting that they were right. Once we were up in the air, I knew we were going up but the height never really bothered me. Our guide was a witty gentleman who definitely knew his stuff. He didn’t get to talk too much as he was trying to find our “sweet spot,” but he was very personable and somehow made us feel safe 1000 feet about the ground with nothing but a giant balloon holding us up. Landing wasn’t bad at all either. There was a couple of bumps, the balloon was secured, and we were done. Unfortunately, because of the area we were in, we landed on private property and the landowner was most displeased. He actually called the sheriff before we’d even landed – just in case! Thanks crabby man. Interesting fact for you though – hot air balloon landings are considered emergency landings (as there’s little control of where they happen), so the balloonists have greater capability to justify landing wherever they can. Anyway, we left the team to pack up the balloon and headed back over to the launch site for our balloonist ceremony and breakfast. I don’t want to give away the secret ceremony, but suffice it to say it involves champagne –nothing bad about that! After breakfast we headed back to our cars, each with our own Certificate d’Ascension en Machine Aereostatique. 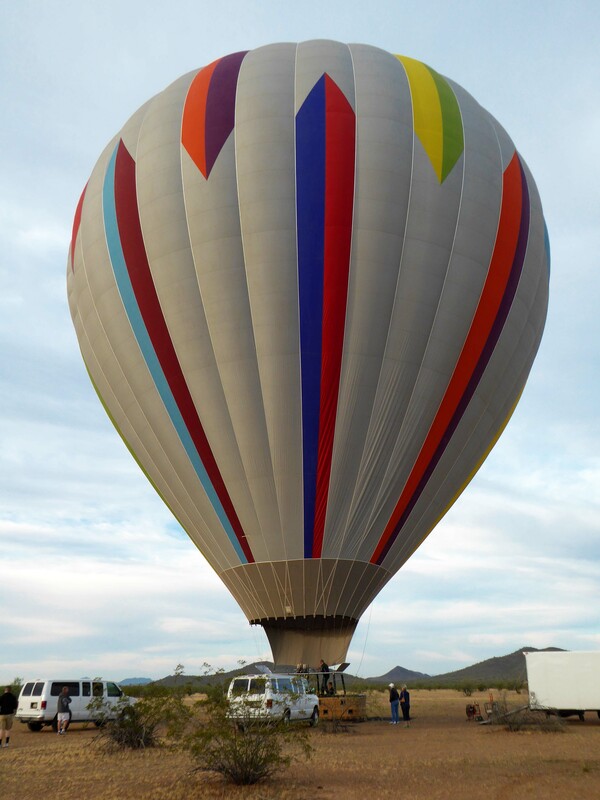 * We went up with Arizona Balloon Safaris and I would absolutely recommend them to anyone in the Phoenix area. They didn’t even know I had a blog, so this is definitely not a sponsored post, just a happy recommendation. They have a great FAQ page if you’re looking to learn more technical info on the experience. Beautiful! I have sworn I’ll never go up in a balloon held up by fire, but you make it sound fun! Cool pictures, and I’m glad to hear from a fellow height-fearer that it was a great experience!